For any business, the best visitors on the website are the ones that are actually looking to buy something because they are probably visitors who can easily be made to convert into customers in the long run. They are often the people who know they are there because they want to make a purchase, something that interests them – something that impresses them! They are the people arriving with credit or debit cards in hand and now it’s your responsibility to see to how you actually seal the deal! For businesses that are dealing with motivated customers in the process, it just requires making the action taking part easy. You will need to present a far more compelling and competitive offer and that should set you on the path of answering those magic questions. So what are the magic questions? Is the airfare included in the price? Will the sheets on bed be soft as expected? What are the kinds of activities allowed there? Are drinks included in the all-inclusive fee? Who and what will take me to the resort from the airport? People of what age will accompany me? Am I going to make a good fit among those? Is it really safe as I expect it to be? Will the outfit/s fit me well? What if I don’t like them? What are the return policies going to be like? How am I finally going to look after wearing the outfit? Is my spouse/friend going to like it too? What material is the dress made of? Is it suitable for me? It’s quite natural for the buyers to feel scared about buying things they have never ever purchased in the past. It should also be noted that the more expensive the outfit, the bigger is the fear of the buyer who may think umpteen things before making the final purchase. As a result, purchasing decisions may get affected in an unexpected way. Price tag can also cost them a mistake they would never wanted to afford which means they do have a heart in the purchase but their mind fails to admit and confirm the purchase. This is where the magic questions do really come into picture. It not only helps them get rid of the obvious fear we are talking about here but also helps them in making a purchase with much confidence and without any kind of fuss. Magic questions help them ponder on the fact that this is really the kind of product they have been looking for. These are also the kinds of questions that help the customers gain reassurance on the fact that making the purchase of the concerned product is not really going to be a mistake. How to figure out your magic questions? There is not really anyone who can fully suggest you on all the magic questions that would be suitable and most beneficial for your business. The truth is that you will have to figure it out all by yourself either with experience or exposure. This can also be done by actually observing your customers and target audiences in action; even talking with them can largely help. Let’s discuss more. Now say you need to sell dresses and outfits for the elderly, how do you go about it? You can visit their comfort zone and sphere that comprises of their daily life, step in and start pulling them from there. Make arrangements to visit their office or house wherever they are commonly found shopping for clothes and then ask them to visit your site. Just remember, don’t make promises that you can’t deliver! Strategy making is the key:Since your ultimate goal is to boost the conversions, you have to be little careful while framing your strategy. You can also research online to get access to websites that can help you focus on your pitfalls and drawbacks. You can choose to visit a safety steps seller website in the UK – http://www.safety-steps.co.uk and find out what they have been doing to boost conversions. If little things tend to capture your attention and seem to convince you well, try it on your site too! Pulling customers in for noticing online behaviour:Request them to shop on your website and ask for honest feedback, if they care to speak about your site, it really means they ‘care’! Your ultimate goal should be to observe their behaviour while surfing on your website. Know how they shop, what do they actually look out for the most and also in what order and what are the questions they need answers for. Now optimise website accordingly:Your focus should also be on how your customers are actually browsing your category products and not only on how they are putting them into use. Once you are aware of the process they usually follow, you can optimise your website accordingly and ensure that it further provides answers to most (if not all) of the magic questions at the initial stage. # Customer interviews also help! You can also hold face to face or Skype/phone interviews with the customers. The main focus of these interviews should be to figure out all the possible questions to which they are looking answers to, while they are shopping for the kinds of products available on your website or those that you sell. You must also make out how they are into comparing the different opinions? What is the typical shopping behaviour for a particular product like? What are the features or the parameters that they pay utmost attention to? When was the last time they actually bought a particular product? The goal is to completely understand why they buy a product and how they are into making the purchase. This is also because you really want to identify those magic questions at the earliest! Figure out the information they want about a product on your website and that is it – you have identified the magic questions! # Few additional tips – Change the game! Don’t lose. Don’t forget. Seek interviews from customers. Copy down everything and best is – record the interview. Take notes like a crazy human being. Do it! Involve more than one person to do the interview right at the same time. This will surely help you in getting some of the useful insights and you can also follow up with the discussion you ever wanted. Do ask unplanned questions and get prompt replies on the same. When everything goes planned, it looks like a monotonous pre-written script. Make it interesting with the off script questions – spill the beans of spontaneity! Engage in the fun and make the interview happening and fulfilling. Indulge in it as if you are conversing casually. This can often be a real challenge and probably the final destination, summarising your efforts. When you have identified the magic questions, putting them into your ‘copy’ to make it a unique piece can be an exciting thing to do. Share the points with everyone involved with the website and is working on it to make it better. It’s like spreading the word to all those concerned so that the collective effort can bring up the much desired effect as soon as possible. Your product copy should provide answers to all the magic questions you have identified. Take a paper and put down all the magic questions and make sure that you are ready with a checklist that helps you reform each and every product page on your website. If the product pages have some of the crucial answers missing, make sure you add them right away! You can also choose to create FAQ page which can do wonders in boosting the rate of conversion on your website. Bounce rate:With an increasing bounce rate (or over 50%) for a product page, it can be clearly said that the magic questions on the concerned page are not really being answered. However, there can still be other things that may affect the bounce rate but if everything else seems to be fine, you are probably waiting for the magic question trick to arrive. Conversion: The saddest part is when people are really eager on buying a product but refrain from doing so ONLY because their magic questions are not answered. This means they are not going to buy the product anyway. Answer the magic questions as soon as possible. Magic question seems to be like a simple, easy and nice concept. No doubt it is but in reality it is more of a vital concept that’s becoming immensely challenging with time. When it comes to conversions, they can do the magic! 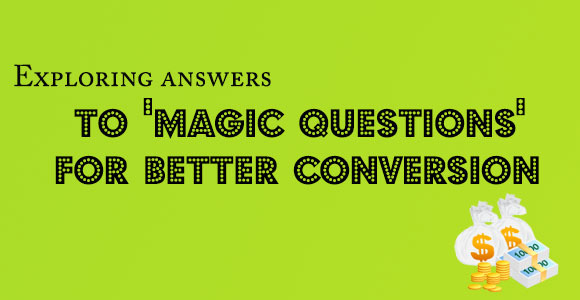 Start answering those magic questions on your website and see how it contributes to boosting the conversion rate – naturally and flawlessly! Author Bio :Colin Boykins is a blogger by profession and he is currently associated with leading UK based safety steps manufacturer – Safety-steps.co.uk.